Our eyes were drawn towards this group of stylish individuals with impressive sartorial sense and striking outfits. On the left is Kent in a grey printed blazer from Calvin Klein over a printed button-down top. 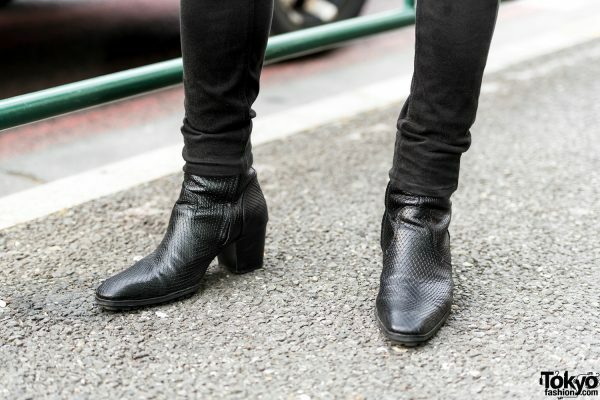 The 17-year-old student also wore black skinny ripped jeans and Yosuke black snakeskin boots with block heels. 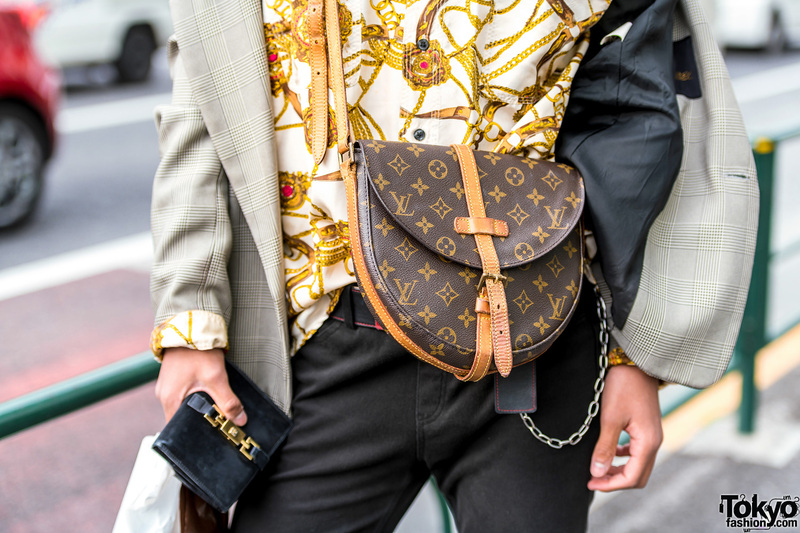 He finished off his look with a Louis Vuitton bag and a hoop earring. Kent gets his favorite fashion pieces from 13Month, and he regularly posts updates on his Instagram and Twitter accounts. 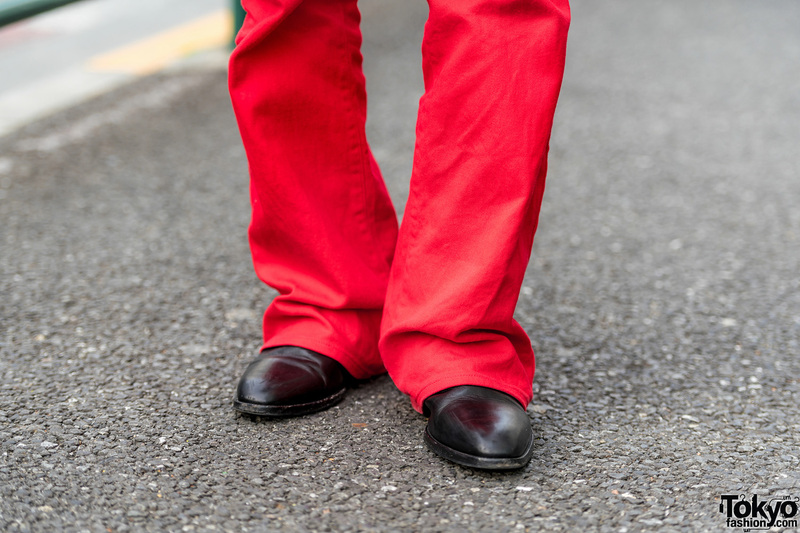 In the middle is 19-year-old Kodai in a vintage red jacket with matching vintage red pants. 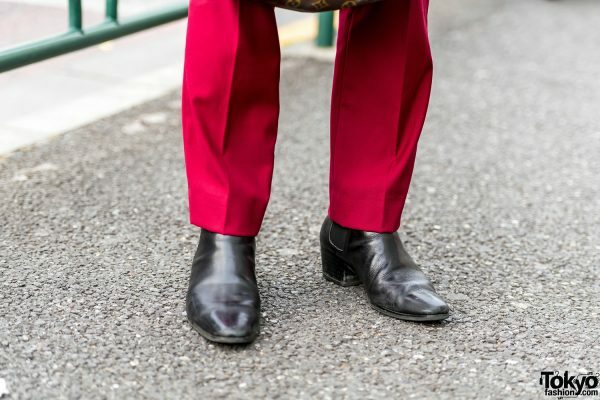 He wore them with a red printed top and black leather shoes – both of which are from Yves Saint Laurent Paris. 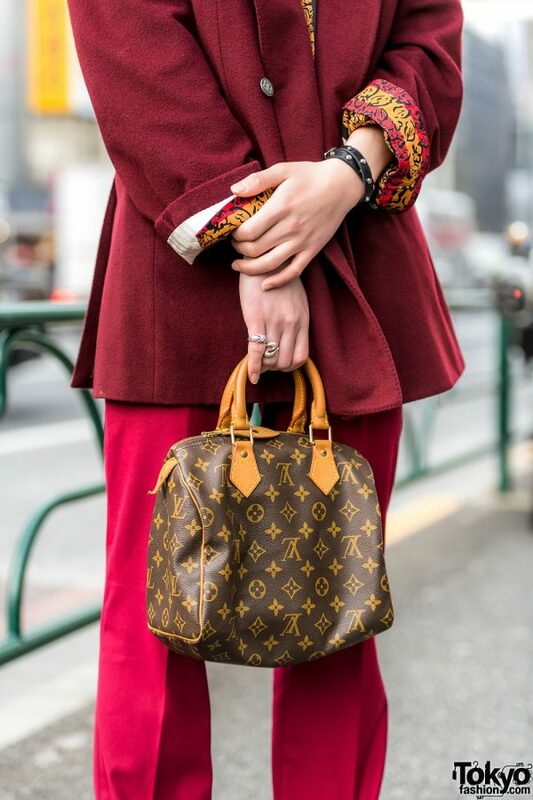 Kodai carried a Louis Vuitton clutch, wore multiple chunky rings, and added a stylish flourish to his look with a black hat and a furry burgundy stole. His accessories are from Maison Margiela. 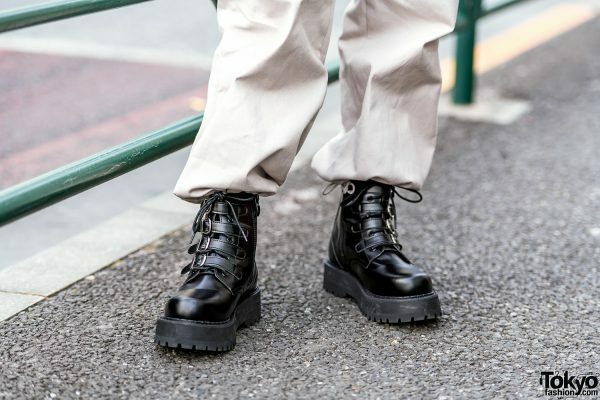 Kodai’s favorite fashion brand is Yves Saint Laurent, and he enjoys listening to music from 卍LINE. Follow him on both Instagram and Twitter. 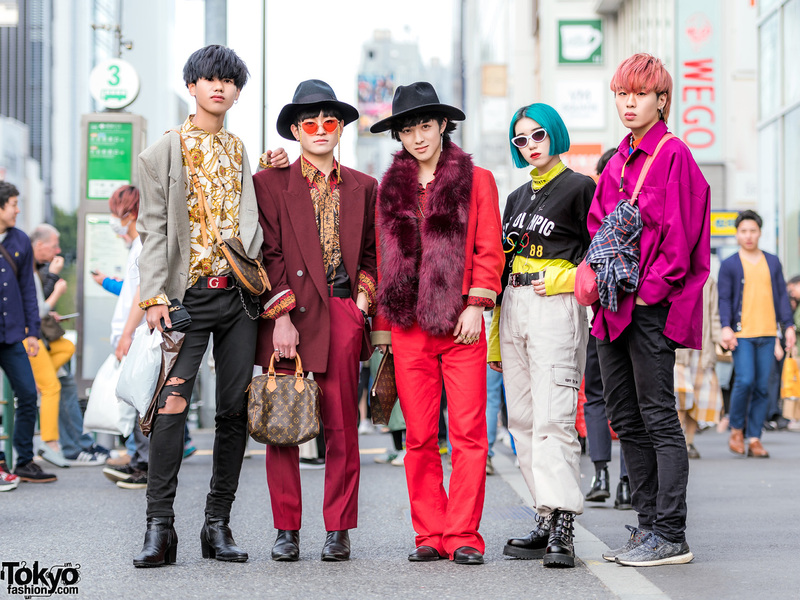 Second from the left is Yonta, who donned a burgundy jacket from Balenciaga. It featured wide lapels and a double-breasted silhouette. 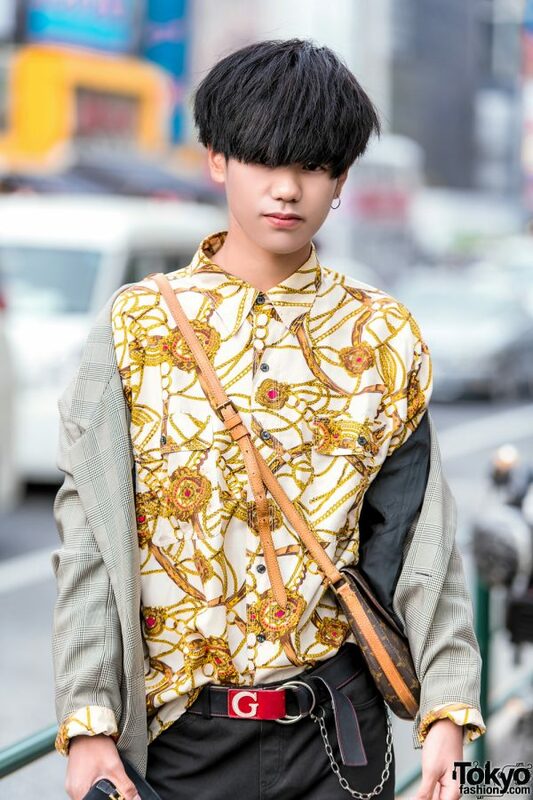 The 17-year-old student wore it over a printed button-down top with the long sleeves folded over the cuffs of his jacket. 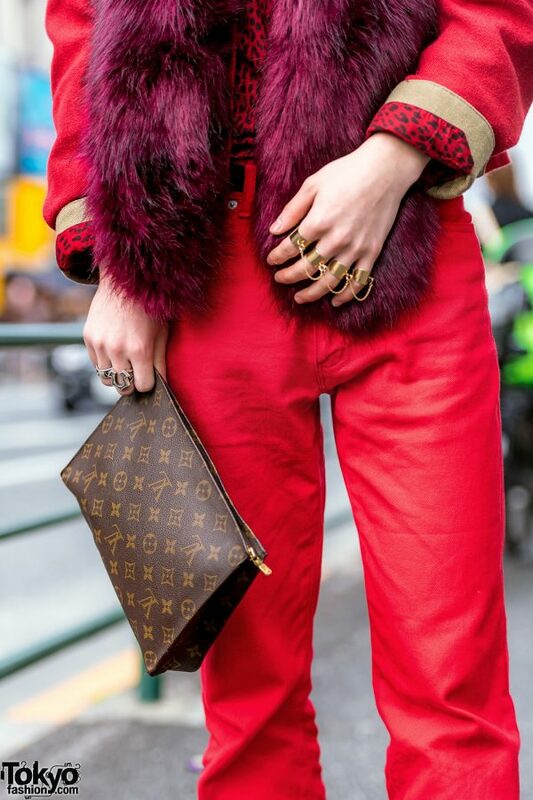 Yonta styled them with red pants, a Louis Vuitton handbag, and Lad Musician black leather heeled boots. 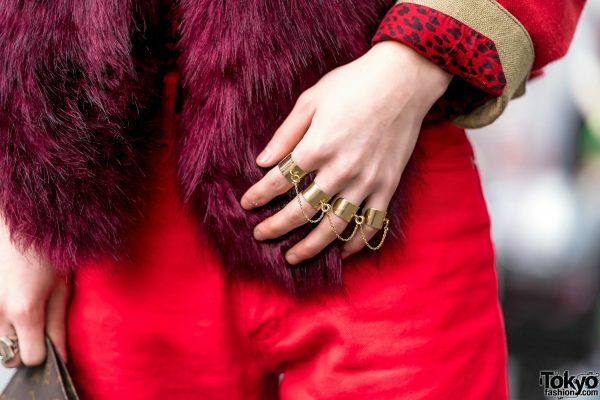 His accessories – some of which are from Saint Laurent – include silver rings, a black leather bracelet, a black hat, and sunglasses with red tinted lenses and a gold chain strap. For more on Yonta, follow him on Twitter. 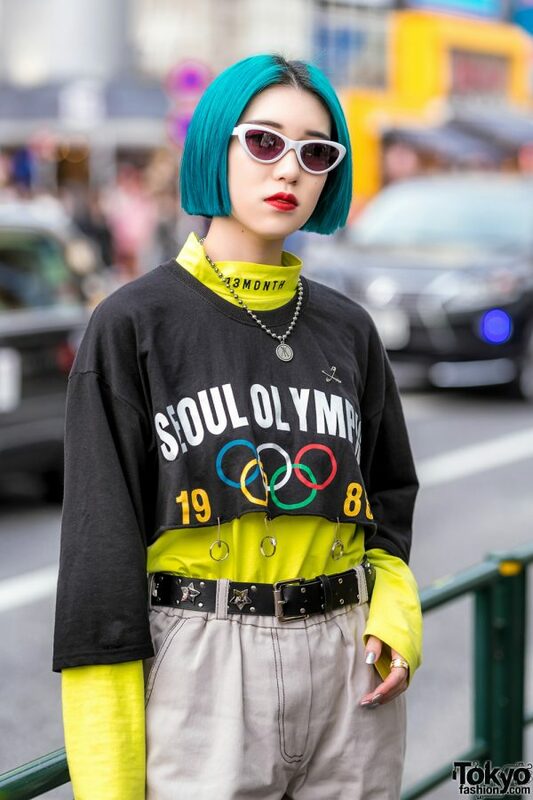 Blue-haired Mahiro wore layered tops including a handmade black crop top and a yellow turtleneck top from 13Month. 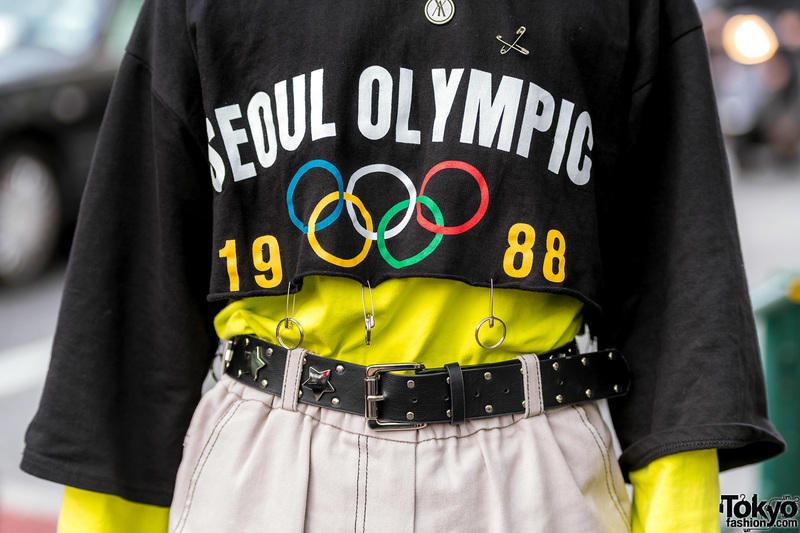 The 20-year-old Harajuku apparel staffer also wore Open The Door khaki pants with a black leather studded belt. 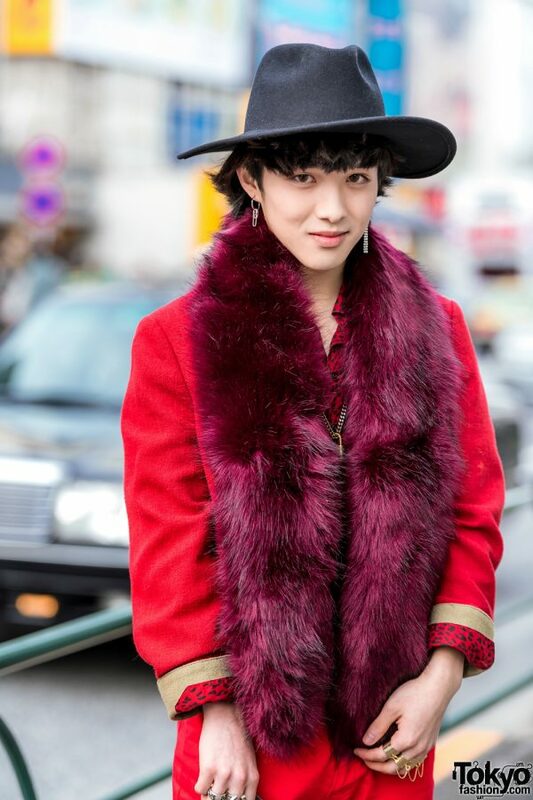 Mahiro styled her look with Bubbles black leather buckled boots, a Kangol bag, silver nails, red lips, and a sleek blue bob. 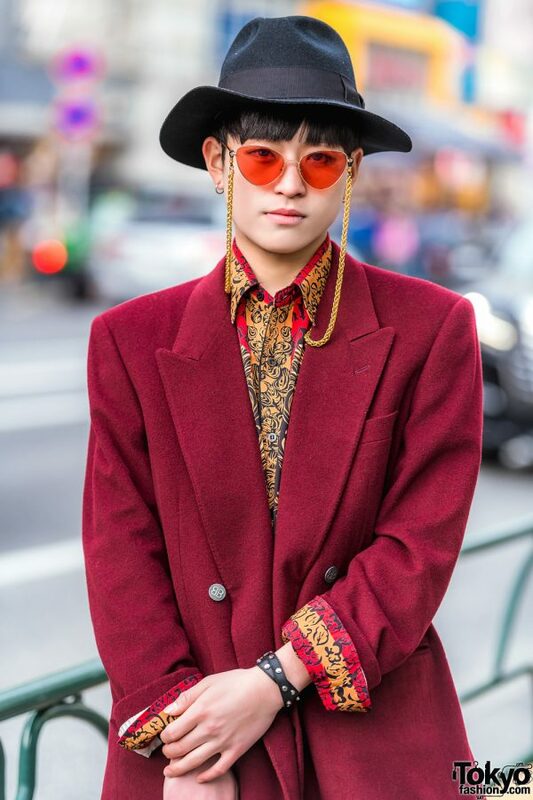 She capped it off with a Tory Burch ring, sunglasses with white frames and purple tinted lenses, and a necklace from Another Youth. Mahiro’s favorite fashion brands include Another Youth and More Than Dope. She also loves listening to music from Big Bang and Block B. For more on Mahiro, follow her on Instagram and Twitter. Finally, Youhei donned a loose purple long-sleeved top from More Than Dope with black jeans. 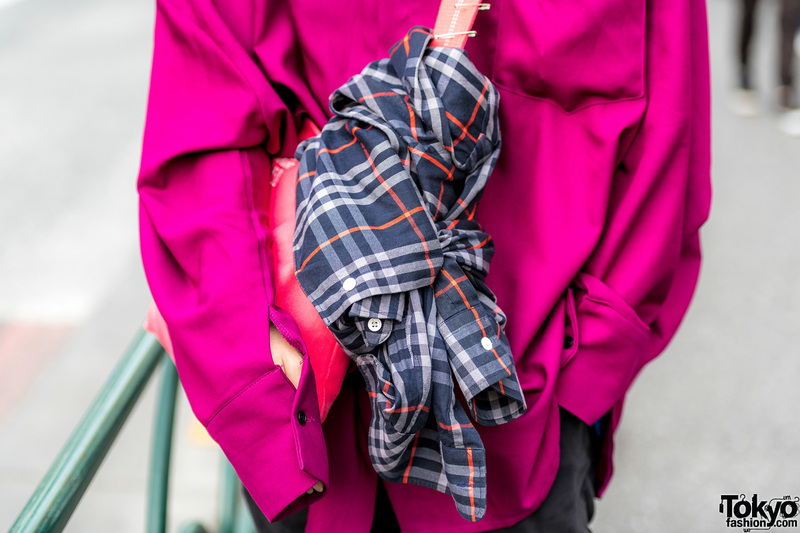 The 19-year-old student also had on a handmade crossbody bag with safety pins and a flannel shirt wrapped around the strap. 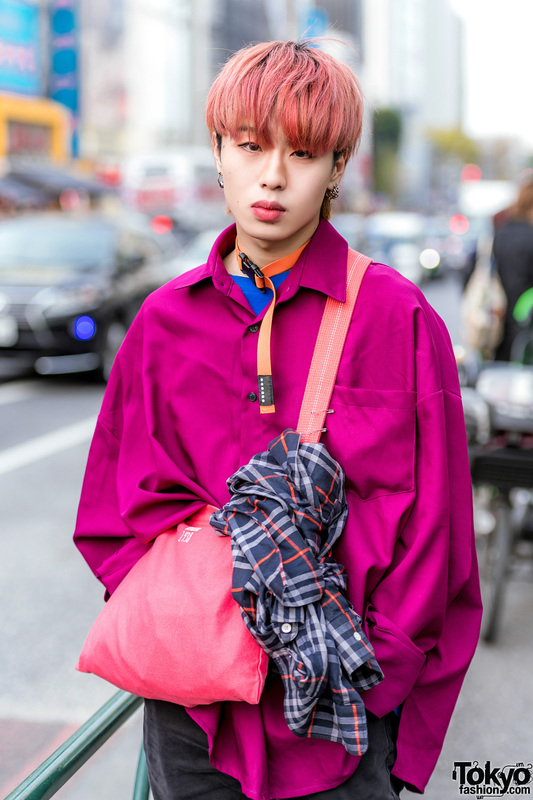 He finished off his look with orange hair, Adidas sneakers, and accessories from Kobinai. 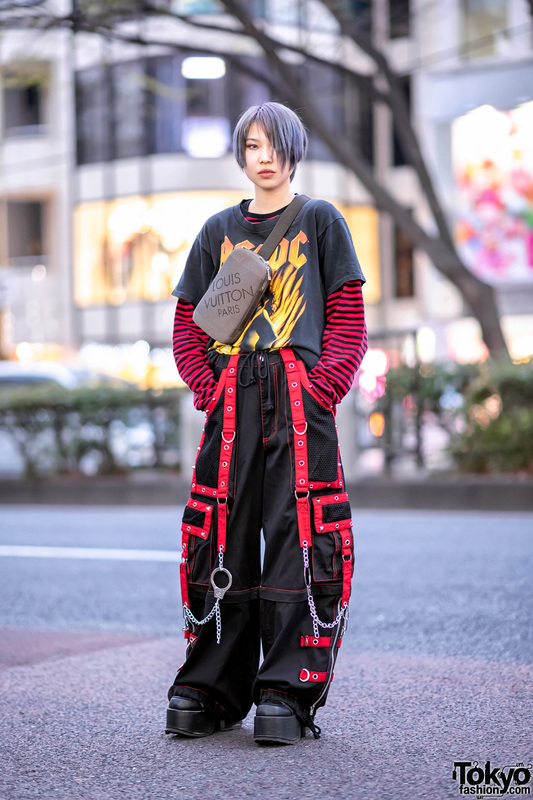 Youhei’s favorite fashion label is Vivienne Westwood.